India vs Australia 3rd Test Melbourne: Twitterverse just cannot keep calm after India captain Virat Kohli registered a rare fourth ball duck during the ongoing 3rd Test at MCG. India vs Australia 3rd Test Melbourne: Twitterverse just cannot keep calm after India captain Virat Kohli registered a rare fourth ball duck during the ongoing 3rd Test at MCG. This was Kohli’s last knock of 2018 and he signed off a wonderful year on a low, but Twitter believes he was just being a dutiful husband. Not long back, Bollywood actress Anushka Sharma came up with a film titled ‘Zero’ where she was playing a scientist with cerebral palsy. Twitter is abuzz with memes and jokes over the couple ending 2018 with a zero. Some fans also felt that Virat Kohli has taken the promotion too seriously. 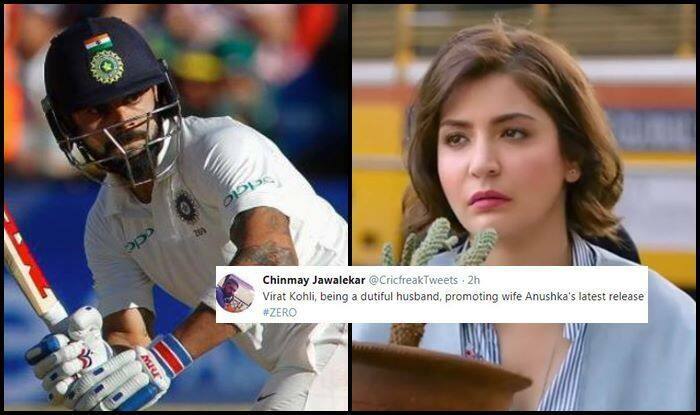 Virat #Kohli took the promotion of “#ZeroMovie” very seriously! He didn’t enforce the #follow-on and ensured he made #Zero runs!!! That’s commitment to the wife!!! Meanwhile, at stumps on Day 3, India has a handsome lead of 346 runs, despite reeling at 54/5 in their second innings. Earlier in the first innings, Kohli hit a brilliant 82 and stitched a crucial 170-run stand with Cheteshwar Pujara who brought up his 17th Test ton. The game is highly tilted in favour of India, but with forecasts of rain lurking on Day 4 and Day 5, seems like the only way for Australia to save the Test and go to Sydney 1-1.